I’ll take “It’s about to get real” for a thousand, Alex. Well, here we go again. Tomorrow is probably the biggest strongest risk of severe weather we’ve had in my neck of the woods since April 27th. See that orange purple spot in Central Alabama. Those aren’t happy colors. The STP is “significant tornado parameter”. It’s about 45% for my area. That means I have a 45% chance of seeing a tornado/rotation within 25 miles of any spot in that purple/orange area. Basically where I live, work, and shop. 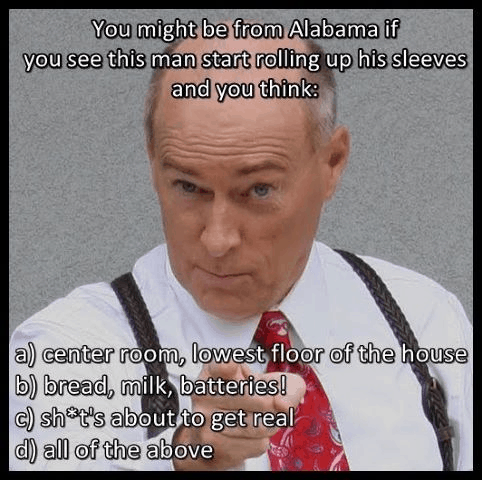 Needless to say, I’m glued to my main weather man, James Spann. He saved many lives on that day by preparing DAYS in advance that it was a “storm of our lifetime” type of event. All the parameters were in place for the perfect storm and all that was left was to hide and watch. As many readers know, it was an event that still wakes me up at night drenched in cold sweats. And those mornings are hard to get started. It’s easy to lie in bed and cry at the memories and faces and sounds. But as the rest of the town has done, we get up and keep moving. Nothing will get accomplished by getting stuck in the ruts. What’s different about this time? We are all so weather aware now. I could stand in Bryant Denny Stadium and shoot the T-shirt launcher thing using water balloons. 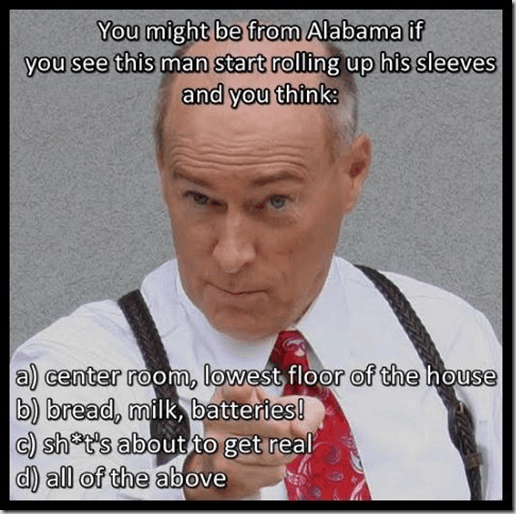 I guarantee each person that gets wet has a weather app, weather radio, phone chain, satellite AND cable TV, or knows how fast to get to the nearest sports bar that will be playing Spann’s weather live streaming coverage. I remember a few weeks ago, several of us teachers had gotten together over the holiday break when some storms got bad. Sure enough, all our phones started pinging with people calling to see if we knew bad weather was coming. We already had the waitress turn off whatever game was playing and all the monitors had James wearing his suspenders. We don’t play when it comes to bad weather. What’s different about me? I think I’m so aware of the potential for me to get overwhelmed that I’m eerily calm. I’ll be at school tomorrow. There is still that huge debate on whether kids are safer at school. But we had 3 schools destroyed and a couple others damaged in April. If we are in school, my focus is on those babies. They’re mine when their parents drop them off in my care. I’ll be ready. I’ll be in my Miss Frizzle (from the Magic School Bus) costume for our Read Across America book character parade, but I’ll have my running shoes on, too. It’s going to be a long night and day tomorrow. I better get my costume ready and get some sleep. See y’all on the other side. Previous Post: « You’ve got to be kidding me.